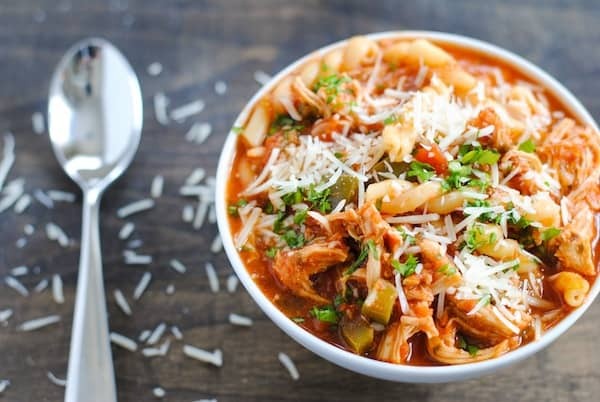 This Slow Cooker Chicken Parmesan Soup has all of the flavors of decadent Chicken Parmesan in a waistline-friendly crockpot soup! Takes just minutes to prep. When I was growing up, my mom had a crock pot that she used to make exactly one thing – her “vegetable” soup, which really also contained beef short ribs. Midwest livin’, man. 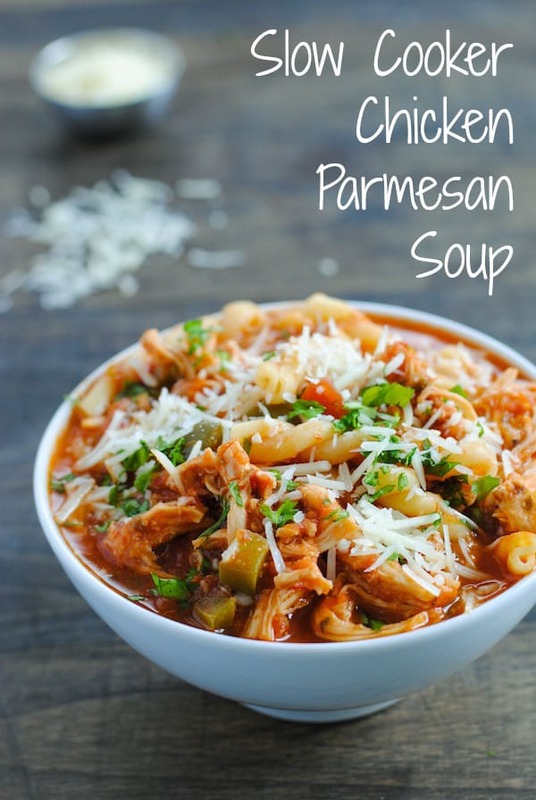 So from a young age, I associated slow cookers with homemade soups like this Slow Cooker Chicken Parmesan Soup. Crock pots really are a great way to make soup, as the ingredients have all day to slowly simmer, release their flavors, and come together into one harmonious bowl of deliciousness. 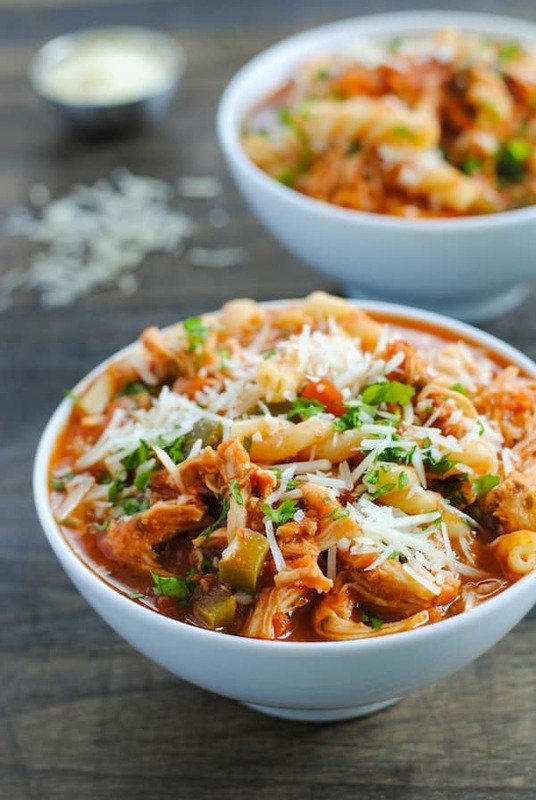 This Slow Cooker Chicken Parmesan Soup has all of the flavors of decadent chicken parmesan, but is much more waist-friendly than the dish that inspires it. 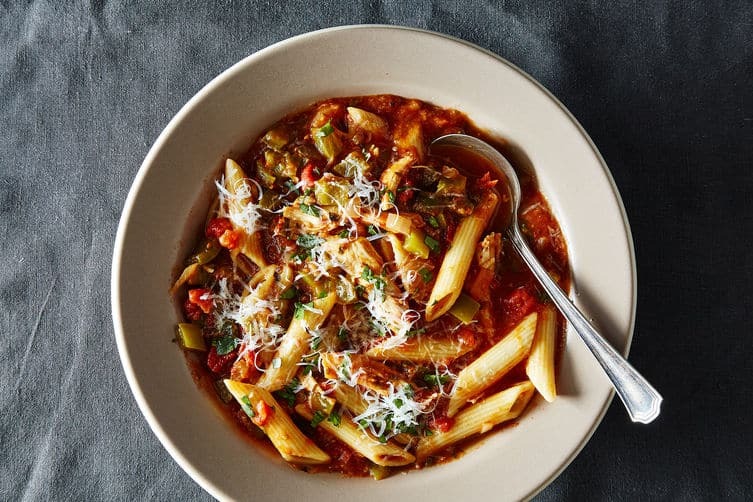 Chicken broth, chicken breasts and crushed tomatoes are simmered all day with garlic, onion, basil, oregano and red pepper flakes for an aromatic base. Just before serving, the chicken breasts are removed, shredded, and then returned to the pot (just like my mom did with the short ribs in her not-so-veggie soup). Gemelli pasta (or any long, tube-like shape of pasta) is stirred in at the same time, and in a half hour, the pasta will be cooked to al dente perfection. Then comes a sprinkle of Parmesan cheese, and dinner is served! 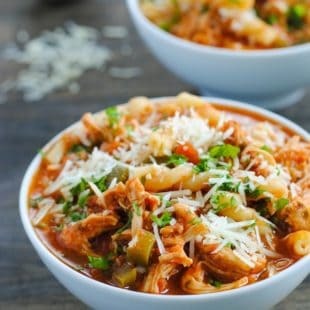 In slow cooker, stir together garlic, bell pepper, onion, tomatoes, chicken, broth, 1/2 cup cheese, basil, oregano, salt, black pepper and red pepper flakes. Cook on high 3-1/2 hours or on low 7 hours. Transfer chicken to cutting board and use forks to coarsely shred; return to slow cooker. Stir in pasta. Cook on high 20-30 minutes longer or until pasta is cooked al dente. Stir in butter, if desired. If soup becomes too thick after pasta is cooked, stir in additional broth or water until desired consistency is reached, and warm through. Home Chef Tip: The butter stirred in at the end is entirely optional. It adds a few calories, but it also adds a nice richness and mouthfeel to the soup.